The Ferrari 250 California - launched in 1957 - is one of the most iconic cars ever created. Half a century later, though, came another 'California'. The 2008 model was designed by Pininfarina - the legendary Italian design house. Superb aerodynamics were key to the car's styling. An 'F1-Trac' traction-control set-up helped keep the power usable - especially when exiting bends and corners! The F1-style Manettino dials on the California's steering-wheel modulated the gearbox, suspension and traction-control settings. Should even their limits be exceeded, an automatic roll bar - and front and side airbags - were deployed. There was a choice of Comfort or Sport modes. At track-days, however, safety controls could be switched off ... apart from ABS braking, that is. The California produced power in abundance. Its 4,300cc V8 made 460bhp. That catapulted the California to 193mph. Torque was on tap from way down low. A 7-speed semi-automatic transmission saw to that. The California was light - its chassis and body both fashioned from aluminium. Inside, there was a roomy and comfortable cabin. And plenty of luggage-space. The retractable top completed the set of creature comforts. 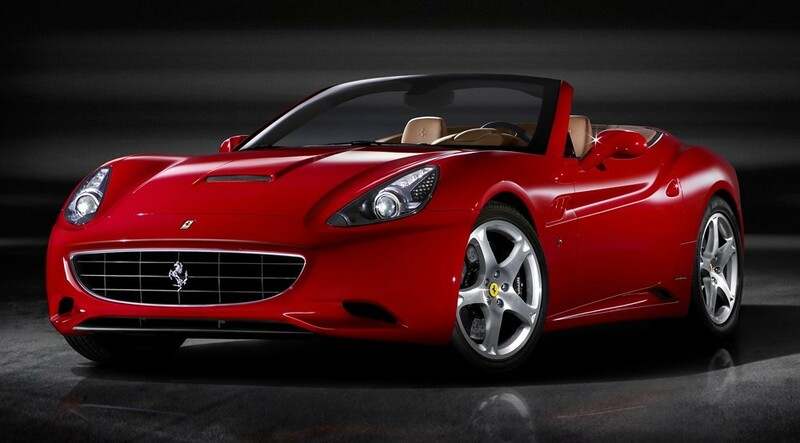 So, like its fabled 250 predecessor, the Ferrari California was built for speed. But - also like that car - it was kitted out for cruising, should that have been what was required.